Enroll in any of our live classes, and we guarantee that you will pass the ITIL exam. Unlike other providers, online classes offered by ITIL Prime combine experienced instructors and accredited curriculums, with cutting edge online tools designed to help you pass. We are so confident, we guarantee you will earn your ITIL certification after completing one of our classes. All classes and products offered by ITIL Prime are thoroughly reviewed to ensure quality and consistency. Content offered to students, both in-class and via our online systems are accredited by EXIN, and undergo continuous quality assessments. We guarantee that you will pass your ITIL exam after completing an ITIL Prime Live Online Class. Take the exam within 30 days of completing any Live Online ITIL Class. Attend all class days and complete all class assignments, including all online ITIL practice exams. If you do not pass the exam the first time after attending an ITIL Prime Live Online Class, attend the class again for free. Your ITIL Prime online exam prep access will also be extended, free of charge. If you fail the exam more than one time (rare), you will be invited to enroll in the class again, and provided instruction until you pass, free of charge. Your ITIL Prime online exam prep access will also be extended, free of charge. Please submit ITIL examination results to confirm re-enrollment. Many exam institutes (EXIN, PEOPLECERT, etc) administer the ITIL exam. Test fee is paid by the student. In rare occasions (instructor illness, etc), we must cancel a class. If so, we will issue an immediate and full refund of class fee paid, or at your request enroll you in an alternate class. 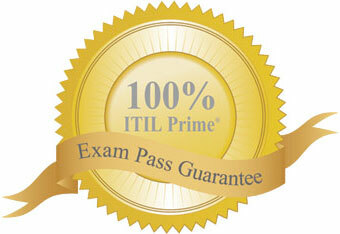 Exam pass guarantee valid only on Live Online ITIL Classes. Self-paced courses are not covered by this guarantee.